Opticron are supported by a nationwide network of retailers who are able to demonstrate and supply our equipment. When you have made a decision on the models you are interested in, contact us either by email or by phone on 01582 726522 and we can answer any product related questions you have and put you in contact with the nearest dealer most able to help you. Alternatively click on the link below to find your nearest UK dealer. Field events are a good place to test and compare equipment under field conditions. Some of the events are attended by Opticron staff who are able to offer expert advice on the model range as well as help you make the best choice based on your budget and individual application. To find an event near you click on the link below. Some of our products can be ordered via our website. These include accessories (cases, neck straps, rain guards, objective lens covers, binocular tripod mounts etc. ), tripods and mounts, digiscoping adapters and magnifiers. Payment can be made by credit or debit card (Visa or Mastercard) or PayPal. All payments are made securely via the SagePay payment gateway. Mastercard, Visa and Visa Debit are welcomed and can phoned through on 01582 726522 (Monday to Friday between 9.00am and 5.00pm UK time). Credit and debit card orders should be accompanied by cardholder name and address, card number, expiry date, issue number where appropriate and the last 3 numbers printed on the signature strip on the reverse side of the card. Opticron are supported by a number of distributors and retailers in EU member states who are able to demonstrate and supply our equipment. When you have made a decision on the models you are interested in, contact us either by email or by phone on +44 1582 726522 and we can answer any product related questions you hav e and put you in contact with your local distributor or retailer. Alternatively, some of our regional partners are listed on the country-specific pages of our Global Portal - click here to visit that site. All our products are available to order online for EU customers. Prices are shown in sterling and include VAT at the current UK rate. Delivery charges are calculated based on the size of the goods ordered and will be added to your basket automatically. All prices listed on the website include UK sales tax (VAT) at the current rate. For individuals purchasing within the EU, UK Sales Tax (VAT) is payable at purchase. No import duty or sales tax is payable on receipt of goods. Mastercard and Visa are welcomed and can be phoned through on +44 1582 726522 (Monday to Friday between 9.00am and 5.00pm UK time). Credit card orders should be accompanied by cardholder name and address, card number, expiry date and the last 3 numbers on the signature strip printed on reverse side of the card. For security reasons deliveries are made to the cardholder address only. Cheque in sterling payable to Opticron. International bank credit transfer in sterling, euro or US dollars only. Contact us for more information. We offer a 3 to 5 day service subject to items being in stock. All charges are subject to size and weight and will be itemised on your quotation. 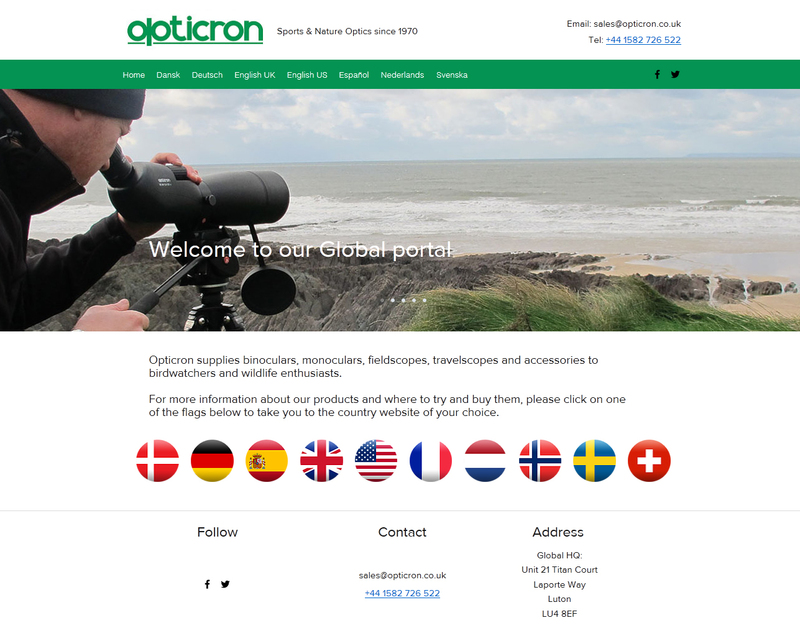 Opticron are supported by a number of distributors and retailers in many different countries who are able to demonstrate and supply our equipment. When you have made a decision on the models you are interested in, contact us either email or by phone on +44 1582 726522 and we can answer any product related questions you have and put you in contact with your local distributor or retailer. Our products are available to order online for customers in certain countries outside the EU. These include Australia, New Zealand and South Africa. Prices are shown in sterling. Sales tax (VAT) will not be charged on orders destined for countries outside the EU. Delivery charges are calculated based on the size of the goods ordered and will be added to your basket automatically. Please note import duty and sales tax charges may be applied to the goods at point of import. For your reference equipment is sent under international tariff code 90 05 10 00 Binoculars and Monoculars. Export prices are quoted in sterling and are exclusive of UK VAT. Mastercard and Visa are welcomed and can be phoned through on +44 1582 726522 (Monday to Friday between 9.00am and 5.00pm UK time). Credit card orders should be accompanied by cardholder name, address, card number, expiry date and the last 3 numbers printed on the signature strip on reverse side of the card. For security reasons deliveries are sent to the cardholder address only. We offer a 5 to 7 day service subject to items being in stock. All charges are subject to size and weight and will be itemised on your quotation. Please contact our US sales office or visit www.opticronusa.com for more information.